Ever wonder exactly how your home is being put together – what techniques, products and systems are being used? And what makes one technique better than another? We’re breaking down the basics of building science to help you understand how your home is actually being constructed and sharing what we do differently from other builders. Without bogging you down with too much minutiae, we’ll explain various techniques and share the differences, pros and cons of each. First things first, we’re tackling the great debate of foundations. There are many different ways to build a foundation and geographical circumstances will often dictate what can and can’t be used. Rest assured that whichever foundation you choose a structural engineer has signed off on the option! **This is probably the most common foundation On Point uses when building houses and it is essentially a mash-up of a pier + beam and slab foundation because it combines deeply placed piers with a floating concrete slab. Instead of beams, you actually have a full concrete slab that sits on piers. Here’s how we do it and what you need to know about it! On Point uses Bell Piers, piers that bell out at the bottom adding an extra layer of stability, instead of the standard straight shaft pier. 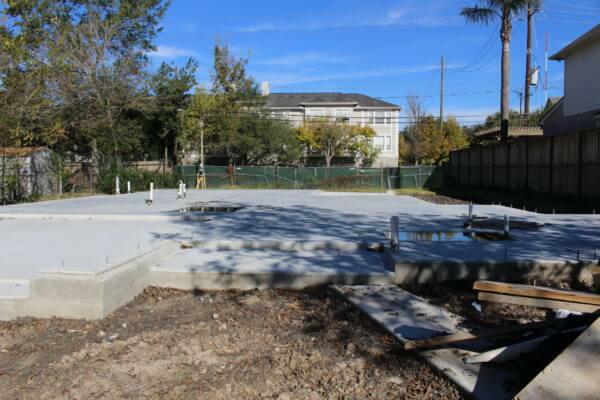 After the piers have been drilled, stabilized, poured and inspected, we lay down void boxes before pouring the slab. What’s a void box? The technical definition is a versatile and economical means of forming concrete, but in reality, it’s a fancy cardboard box we pour the concrete over. While this technique uses a slab of concrete, it’s different than a slab on grade (aka dirt) because the void boxes create a void of space between the foundation and the dirt. Over time the void boxes deteriorate allowing room for the soil beneath the foundation to expand and contract without it affecting your slab. Pro: It is great for climates where frequent soil movement is common as the void space between the dirt and the slab provides flexibility, so your slab is less likely to endure damage from settling. Con: Piers add cost, which makes this type of foundation more expensive than other options. 1 cement truck is equal to 10 yards of concrete, so expect 15-30+ trucks lined up on foundation pour day. Crazing in slabs, small hairline cracks up to the width of a quarter, is totally normal and does not affect the integrity of foundation, so don’t panic!